The expressway was proposed to begin at the Irwin interchange of the Pennsylvania Turnpike or the western end of the Greensburg Bypass. It would then cross the southern section of Allegheny County to Interstate 79. 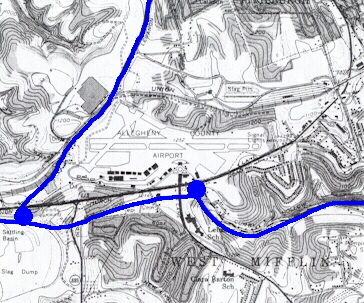 There was also a plan to build a spur into Pittsburgh to connect to the Penn-Lincoln Parkway via the newly constructed Glenwood Bridge which would answer the question of why was a large interchange built at the southern end of the bridge. This route would serve as a much needed bypass of the Pittsburgh area, and connect communities in the southeastern metropolitan area. It would also have reduced the amount of traffic using the Squirrel Hill Tunnels. Century Square shopping plaza currently sits. Information courtesy of the Pittsburgh Area Transportation Plan, Adam Prince, and Matt Boyko.